Spend RM50 (Aeon member / Aeon credit card holder) or RM80 (Non-Aeon member /non-Aeon credit card holder) and above in a single or combination of 2 receipts at any AEON store and AEON shopping centre tenants. 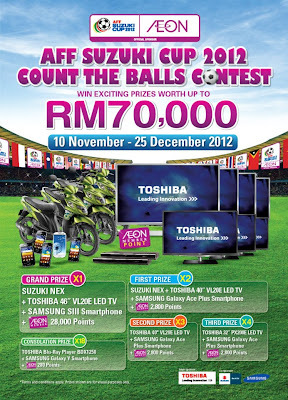 Count the number of balls in the Toshiba TV below and write it down on the white box provided. Complete a simple slogan and submit your entry into the contest box provided at any Aeon store and Aeon shopping centre. The contest has ended. Check out the result here! when the result will be announce ? on where ? It that is a real game ?